Kompa Magazine • T-VICE: KOMPA MAGAZINE song by song "NTPF" CD REVIEW! T-VICE: KOMPA MAGAZINE song by song "NTPF" CD REVIEW! Here is our official KOMPA MAGAZINE song by song CD REVIEW of T-VICE's latest. 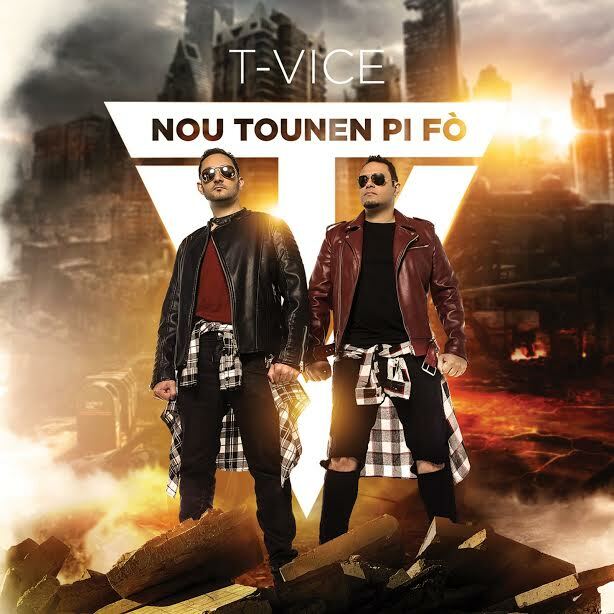 *NOU TOUNIN PI FO: Kickoff track from the CD. This is the kind of track that I suspect will do its work on the LIVE BAL CIRCUIT. TO "ME", this track doesn't really go into second gear until that Berto guitar groove comes in....in the second half of the song. COOL RAP by Cardozo in there, as well as Rey's keyboard chops; having said all that, this is the kind of song where you will appreciate it more and fully "LIVE". Solid track....but on the uptempo department.....I have heard better from T-Vice....but MAKE NO MISTAKE ABOUT IT....They will work the s**t out of that one LIVE. I will give you an example...The studio version of "Chache Fanm Pa w" did not do much for me....but when they played it LIVE, it was one of my favorite LIVE tracks from the band....and it became a BAL FAVORITE from the fans THIS song is set up to be a LIVE BANGER. *MOVING ON: FIRST LISTEN "GOL" when the VICE crew made me listen to the song in the studio before the cd came out. I also thought it made great sense when they told me it would be the first music video. VERY CATCHY CHORUS, as well as heart tugging lyrics where Roberto talks about his divorce from his ex-wife. Tears almost came out of my eyes when I heard it in the studio. I don't care if I stand alone in what I am about to say; but I strongly believe that Roberto is highly underrated in the COMPAS LOVE department...simply because I think when he gets the RIGHT SONG THAT FITS HIS STYLE IN THAT DEPARTMENT ("Innocent" and "Confession" are 2 of a few that come to mind right off the top of my head)....he delivers the goods. GREAT STRATEGY from them to release a slower track as the first song off the CD instead of the usual uptempo banger....and I believe they will reap the rewards of that move very very soon. This is a general topic that many listeners will be able to relate to...about finding love again after the sadness of a divorce. I EXPECT THIS SONG TO DO BIG THINGS FOR T-VICE. *ESKE: One thing that jumps right off the bat as soon as you hear REGIMUZIK on this track....is THE GIFT OF HIS AMAZING SINGING VOICE. The keyboard work from Babyrey on this track in all aspects is excellent. The lyrics on this song by REGI about being "THE LUCKIEST MAN IN THE WORLD", as well as him asking the girl....ESKE W RINMIN MWEN. This song will bring REGI'S STOCK UP "BIG TIME"....with this one, he has a terrific song to properly make his impact on the public. THE GUITAR GROOVE PART on this track is an EAR CATCHER for sure. BRAVO! PYEL CHAPPE.....LI TONBE LI TONBE....LI TONBE! *THIS TIME IT'S 4 REAL: One of my favorites on the CD, and that was from when they made me listen to it before the cd came out. The chorus...."THIS LOVE IS FOR REAL....I DON'T WANNA GIVE UP" is extremely catchy as it will stick to the listeners' brains. When the groove comes in with Reynaldo's keyboards....DANCE FLOOR HEAVEN......PLOGE L TIGHT....JE FEMEN. The second part of the chorus "We're in this battle together....and if we win...it's forever" has NU LOOK FLAVOR written all over it. Mellow compas love track with huge potential for radio and the bal circuit. RANMASSE L SI W KAPAB!!!!!!! One of the songs that I would STRONGLY urge the band to push...and that means LIVE....as soon as possible....NOT 6 months after the cd is out. REWIND "Anmerdeur"
*SE PA SA feat. JPERRY: Different vibe as the Vice crew dives into a different musical world away from the regular familiar compas vibes. Who else to feature in a world beat/Raborday hybrid song but J.PERRY? This song will have its impact in clubs along with people who are into this musical style vibe...but what I like the most about the song is THE MESSAGE about "PERCEPTION" WRAPPED AROUND THIS TRACK. General message SA OU PENSE A....SE PA SA. DON'T ALWAYS READ A BOOK BY ITS COVER! *VOYE MONTE featuring PJ: CLUB CERTIFIED with a groove made for the dance floor from the very first note. T-VICE jumps head first into the GOUYAD sea "SAN JACKET"...with no reservations....and I do believe that this song WILL score for the band......my only worry being it doesn't fight with another similar track on the CD. DJS will be rocking this track a lot at parties....NO DOUBT ABOUT THAT. PA GIN MANTI NAN MIZIK SA. *KONFLI: STRONG MESSAGE on this song written by Pipo St Louis (Radio personality) about the state of our beloved Haiti and the young growing up in it. Message wrapped in some good old compas. I expect radio stations in Haiti to play this song a lot. *OU POKO FLANNE: Shoutout song to some of their biggest supporters on an uptempo track. BAL MATERIAL track about what the title says. Did not really do much for me though as I can say if this song was not on the CD.....it wouldn't be missed.....except maybe by the people getting the shoutouts. *J'EN AI MARRE: 5LAN top dog DJ 5 ETWAL provides the animation here on this groove certified club banger potential. DJS will rock this one non-stop. HIT POTENTIAL glued all over this one...but my concern is that it will fight with the song "VOYE MONTE" because they are both extremely good and are riding the same AVENUE in terms of the GOUYAD Craze. Will the band push BOTH the same way? Will the fans go for both the same way? Time will reveal....but in the meantime.....This song is on REPEAT on my stereo player....just like it will be for many other people as well. I LOVE THAT GUITAR ON THIS TRACK.....It's a "KOULANGET" reaction type of guitar when you hear it come on....if you know what I mean as a music listener/partygoer..
*BACK TO THE GROOVE: Old long time T-VICE fans will find themselves on this salute track from the crew. This is the way that they used to play many many years ago. THIS IS SIMPLY WHAT I CALL A GROOVE "GWOG/TAFIA" SONG that will get the job done at parties on the stage and on the dance floor. BANGER...The marriage of the GUITAR and KEYBOARDS on this song reminds us nicely of the musical chemistry that the Martino brothers have. *OU RENMEN SA: The second of REGIMUZIK's songs on the CD where he takes on the lead vocals. It is geared more towards the ZOUK market. I am not sure how much the band will play this song "LIVE" compared to his other song "Eske"; but this song on CD is an ear catcher that will only help enhance Regimuzik's value/stock. It might be more difficult to PLAY this song "LIVE" and make it sound as good as it SOUNDS on the CD...so we'll wait and see if VICE will push this track the same way that they are doing for "Eske" FANM SA BON BON...TOUT KOL BON...OU PATA DI YON BONBON.....BERTO PASSE M ALUMET LA! WI....MWEN RINMIN MIZIK SA. *FAVORITE SONGS: "Moving On", "This time it's 4 Real", "J'en ai Marre", Eske", "Voye Monte", "Back to the groove", "Ou renmen sa". *BEST LYRICS: "Konfli" and "Se Pa Sa". *WHAT I DID NOT LIKE: The uptempo tracks from T-VICE on this CD (EXCEPT FOR "BACK TO THE GROOVE").....I have heard better on other VICE albums. I thought the song "Ou Poko Flanne" could have been developed MORE lyrically; but it instead turned into a SHOUTOUT ANTHEM to long time close friends/fans of the group. As far as "NOU TOUNEN PI FO"...on CD it's an OK track...and like I said before SE NAN LIVE NAN that they will make you appreciate the song. The T-VICE from the past would have made the mistake of doing the FIRST MUSIC VIDEO with this song because of THE SONG TITLE (Slogan)...I am glad that they went another route strategic wise on this CD. Also very minor complaint...The "BACK TO THE GROOVE" song is the one that should have ENDED the CD to let the fans leave on a FEEL GOOD PARTY MOOD VIBE; so I would have switched it with "OU RENMEN SA" as the CD closer. *WHAT I LIKE: The fact that they incorporated their own VICE SIGNATURE in the 2 GOUYAD songs "J'en ai Marre" and "Voye Monte". THE GUITAR on those tracks make a HUGE DIFFERENCE in terms of the songs just being a straight up 100% GOUYAD COPYCAT....VICE added their flavor on there and that was great. *Even though when you break down the BALANCE in terms of UPTEMPO and mid/slow tempo songs....it's almost evenly balanced; you SENSE that the mid/slow tempos have MORE WEIGHT on there.....I have been telling Roberto to sing MORE of those types of tracks for the longest because when he gets songs that fit him to a tee in that department....he always delivers; and on this CD.....in my opinion, it was proven once again. It certainly helps also that right now...SLOW/MID-TEMPO TRACKS seem to be ruling more than the uptempo counterparts. T-VICE has a CD that has quite a few songs that CAN do damage and become hits on there. Having said all that, the public will decide, and sometimes, the songs that they decide to FALL IN LOVE WITH...are not always the obvious ones as proven by a song like Zenglen's "Rezilta" not too long ago. If I were a betting man, I would put my money on "Moving On", "J'en ai Marre", This Love is 4 Real" and "Voye Monte" in terms of HITS CATEGORY and DON'T SLEEP on "Eske w Rinmin Mwen". I LOVE THE FEEL GOOD VIBE and material on the CD and T-VICE proves once again why they are one of the best FEEL GOOD PARTY BANDS in the business. In my opinion this CD GIN MATERIEL LADAN L POU FE DEZOD POU JAZ LA. The rest is now up to the PUBLIC, as well as THE BAND in terms of STRATEGY and WHICH SONGS they decide to push to the public "more" while the iron is hot. Re: T-VICE: KOMPA MAGAZINE song by song "NTPF" CD REVIEW! This new album has a hit for every market segment on the HMI - Tout moun jwen...yo gen Kompa direk, yo gen kompas love/pleyen, yo gen gouyad, yo gen mizik konsyans and BACK to the GROOVE is that one old school T-Vice style that shutdown any bal. Great breakdown Pat. If Vice la is a top band, they should be treated as a top band. They should be held to the same standard as Zenglen, Djakout, NL & Klass. Their lack of musical maturity cannot by pass me as a konpa Junky. I expect more from a musical standpoint for a band who's been doing it for over 25 yrs. If Djakout, NL, , Zenglen and Klass put a CD like that out, congressional hearing. Saying that, I really like Moving On. This track has the potential to be a hit. Just wishing they'd produce more track like that with some substances. Ernst wrote: Great breakdown Pat. If Vice la is a top band, they should be treated as a top band. They should be held to the same standard as Zenglen, Djakout, NL & Klass. Their lack of musical maturity cannot by pass me as a konpa Junky. I expect more from a musical standpoint for a band who's been doing it for over 25 yrs. If Djakout, NL, , Zenglen and Klass put a CD like that out, congressional hearing.